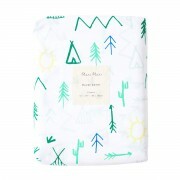 Meredithe Stuart-Smith, whose childhood nickname was Meri Meri, made her first card as a child in Los Angeles in 1985 while sitting at her kitchen table with some scissors, pens and a BIG pot of glitter. Local stationery stores loved her cards and in 1987, Meri Meri presented her collection at the National Stationery Show in New York, which resulted in Bergdorf Goodman picking up the line. After a cross-continental move to England, Meredithe continues to make cards, as well as partyware, bakeware, gifts and patches with a team of 20 designers in a 400 year old building (still with lots of glitter) one hour west of London. 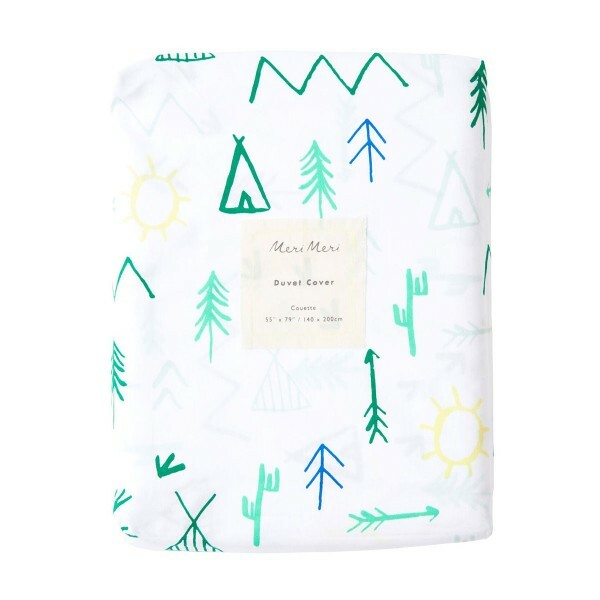 The Meri Meri Campground Organic Cotton Reversible Duvet Cover is decorated with arrows, trees, tents and mountain ranges, and finished with neon yellow stitching to make it the perfect addition to any child’s bedroom. 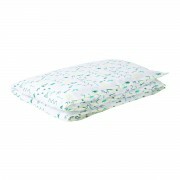 Get the Meri Meri Campground Organic Cotton Pillow Sham to complete the look.